The survey is part of a research project designed to help make New Zealand cities more resilient to earthquakes. GNS Science said this survey invites building owners and occupants to anonymously provide information about the damage their building may have sustained in an earthquake, if services were affected, if evacuation was required, and the time needed to complete repairs. GNS Science is undertaking the survey to fill knowledge gaps in post-disaster recovery and find out more about the potential need for temporary accommodation after a damaging earthquake. Findings will be made available to end users such as councils, engineers, and civil defence operators for possible incorporation into policies and procedures. All New Zealanders are eligible to participate and scientists are particularly interested in hearing from those who have been affected by any of the large earthquakes that have occurred in New Zealand since the magnitude 7.1 Darfield quake in Canterbury in September 2010. Survey co-ordinator and earthquake engineer at GNS Science, Dr SR Uma, said the survey would take less than 10 minutes to complete and all responses would be treated confidentially. “Responses will help us make better estimates of the movement of people and businesses and their relocation requirements after an earthquake,” Dr Uma said. A manager in Wellington City Council’s resilience team, Hayley Moselen, said the Council was keen to connect with the science community with initiatives such as this. Dr Uma said there was no obligation to answer every single question, but it would be helpful to the research if respondents could answer all questions. The survey would remain open until March 2019 and findings would be made available in stages from early next year. 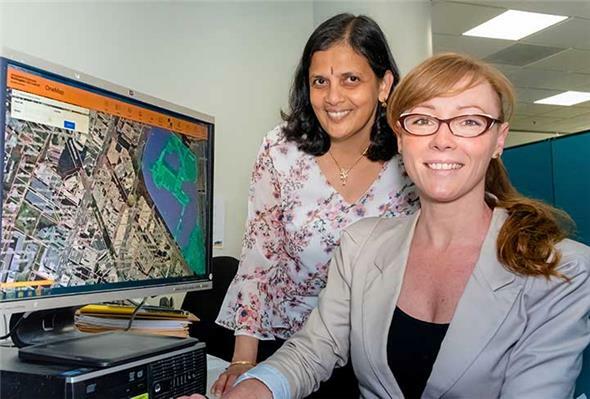 Earthquake engineer SR Uma of GNS Science and Hayley Moselen of Wellington City Council’s resilience team with an aerial image of Wellington CBD. Photo: Margaret Low, GNS Science.